There is a logic to the long Western tradition of protecting offensive speech; this logic is not merely coincidental to the tremendous intellectual and technical achievements that emerged from those nations that embraced it over the past several centuries. Liberty is not only a wonderful environment in which to live―and the natural state of all people―it also yields fruit that redounds to the benefit of everyone―not least among which is the opportunity to test propositions in the pursuit of truth. Yet the unanimous position of all major schools of Islamic law is that speech insulting to Muhammad or the Qurʾan is forbidden, and penalties up to and including death apply to violators. As such, Islamic law stands in direct conflict, on this point and others, with Western civilization and the laws of many Western nations. In sovereign nations, the law of the land governs the land. Technically this is still the case in both the United States and the Netherlands. However, in practice it is frequently not so. Freedom to do something only technically or only in theory is no freedom at all, and Western civilization is under brazen conquest by some Muslim activists―and their witting and unwitting allies―who establish Islamic law by (among other things) tolerating and protecting its ferocious shielding of Muhammad and the Qurʾan from insult. Compliance with Sharia advances Sharia. 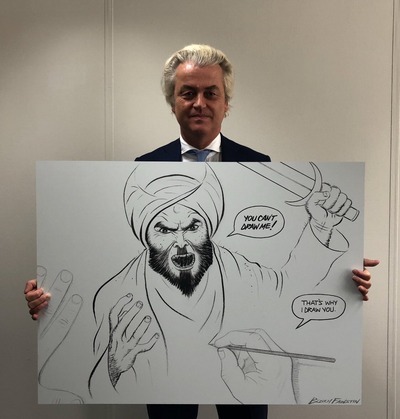 For instance, this November was meant to be the month for MP Geert Wilders' second "Draw Muhammad"; but Islamic law won a de-facto victory over Dutch law mere weeks ago, as Wilders announced the contest's cancellation. When—among many other similar threats—a 19-year-old Afghan stabbed two American tourists in Amsterdam, citing the planned contest as motive, Wilders canceled the event out of concern about further violence. The Islamists had made their point: "Having the law on your side makes no difference. Do what we want, or somebody is going to get hurt." Such antics by Islamist Muslims are not new to Wilders and other speech and conscience advocates. In retribution for his firm and outspoken stance on this subject, he has "spent 15 years living in safe houses and escorted by a security detail due to constant death threats." These are the tactics, of course, of any common mafia. In securing Wilders' retreat, the terrorists established Sharia's authority for now in the Netherlands (in point of fact) on the issue of speech. The first "Draw Muhammad" contest, organized by Pamela Geller and Robert Spencer, was held on May 3, 2015 in Garland, Texas. The purpose of Geller and Spencer, and the purpose of Wilders in organizing another this year, was to preserve space for free speech in the face of known supremacist Muslim intentions to forcefully diminish that space. During the 2015 event, two Muslim men—one a convert but both American-born—armed with multiple rifles and handguns and 1500 rounds of ammunition, began shooting their way into the venue. Both were killed. The purpose of "the Islamist mob" is to assert authority for Islam over all other legal authorities, to become dominant. What is going on, in other words, are tests of national sovereignty, a battle of civilizations. In this most recent round, I regret to report, the winner was not Western civilization, but rather the Islamist mob. My scholarly work with Qur'an manuscripts has taken me into many Muslim countries and institutions, and brought me into contact with hundreds or thousands of Muslim scholars, students, curators, officials, business people and regular folks, both inside the United States and abroad. I have been received in nearly every case with hospitality and kindness and have great respect and affection for many of these friends and colleagues. I am also well aware of the diversity of opinion and culture and even theology within Islam, as well as the fact that there are many who are culturally Muslim who do not embrace Islamic law in every respect. Anyone unable to travel widely to gain similar knowledge at first hand should read Andrew Rippin's wonderful book "Muslims: Their Religious Beliefs and Practices." So, I am not disparaging all Muslims, nor, I might add, were the organizers of the cartoon contests doing so. Those who think they were miss the point completely. I am denouncing the colonizing ambitions of a subset of Muslims (some in the West and some abroad) that I term the Muslim mob, that intend to (and already have in many locales) squash the liberties that lie at the base of our Western civilization—liberties, I might add, to which many regular Muslims have fled to escape the heavy hand of Islamic governance under which they formerly lived. I am also lightly chiding moderate Muslims and others who, by their assent, enable the Muslim mob's agitators to impose their mischief on others. These are the vocal demagogues who take center stage or move about the crowd stirring people up. There are typically only a small number of agitators in any given mob. In this analogy, the agitators are those Muslim leaders and activists, and their Western leftist allies, who call for the imposition of Islamic law's speech limits in the West. These are people who readily assent to the ideas of the agitators. Not all sympathetic attendees take direct action, but their presence and consent by either subtle support helps to advance the cause of the agitators. In this analogy, the sympathetic attendees are the portion of Muslims and non-Muslims in the West and abroad who support restrictions on speech relating to Muhammad and the Qur'an, both those who speak out and those who remain silent as the agitators move their argument forward. These are curious, indifferent, or timid onlookers. They are not sympathetic to the cause and many would oppose it if they gave it some thought but are useful to the agitators for their silence which helps the optics by giving appearance of wide agreement. In this analogy these are regular folks who may know something is wrong but don't want to stick their neck out. Today is a moment in history. Many of us see ourselves as spectators without a serious part to play in the larger affairs of the world. I encourage you to understand that what you say matters. I encourage you to live purposefully and to, in love for your neighbor, take a stand for liberty in speech and deed as you go about your daily life. Do not give up free speech so casually. It is a precious thing. Related Topics: Geert Wilders, Pressure Tactics Against Free Speech receive the latest by email: subscribe to the legal project's free mailing list This text may be reposted or forwarded so long as it is presented as an integral whole with complete and accurate information provided about its author, date, place of publication, and original URL.